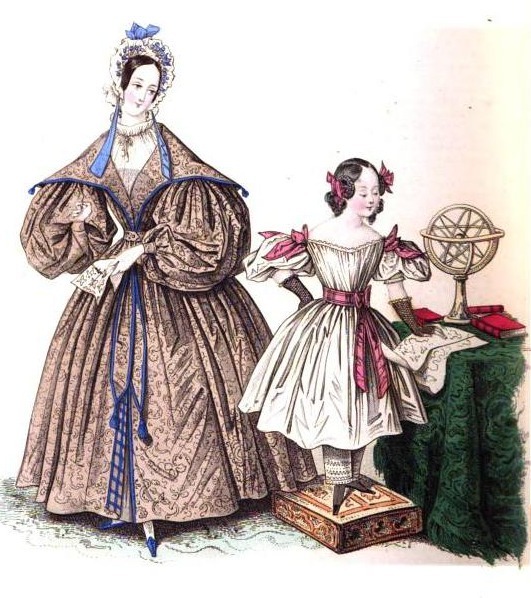 more fashion plates today, including one showing us a pretty child's dress. Enjoy! Robe de chambre of mousseline de laine; the corsage and skirt made all in one. The collar or pelerine is in revers, rounded at back and pointed on the shoulders, where it is ornamented with small tassels: this revert folds back as far as the waist in front (see plate). The sleeves are immensely full all the way down: the dress is fastened round the waist by a ceinture of itself, from which depends two long ends, finished by tassels. A small lisere or piping of blue satin goes entirely round the dress. The robe de chambre is wadded and lined. Cap of Grecian net, with a plain round caul and double border of the same, standing up from the face (see plate): the cap is ornamented with small blue wild flowers, and bows of satin ribbon of the same colour. The hair is in plain bands. On the neck is a guimpe of fine cambric (see plate), with a single frill at top, of the same, festonno at the edge, and which, as well as the entire front of the guimpe, is small plaited; it is drawn in at the neck with a small cord and tassels. Cotton stockings, a jours and wadded silk shoes. Frock and trousers of white muslin, the latter embroidered. The corsage a l'Enfant, the sleeves short and full. Ceinture and noeuds de page of pink satin ribbon: black silk mittens, trimmed at the tops with a ruche or quilling of tulle. The hair is divided in a point (see plate): the front hair, which is curled, falls as low as the neck; and the back hair is brought in two braids to the temples,where it is fastened up with bows of pink ribbon, to match those on the dress. Kid shoes, and gaiters of drap de soie couleur Hanneton. Black velvet dress, the corsage a la Sevigne. ornamented down the front with bows of ribbon placed at distances. Short full sleeves, with double sabots of white satin. The front breadth of the dress being of white satin broche in gold, give it the appearance of an open robe (see plate). On the shoulders are the noeuds de page, of black satin ribbon broche in gold; the ends are long and fringed; a white blonde goes all round the bosom of the dress. Chapeau Castillan of black velvet, with a broad leaf turned up in front, and ornamented with a bird of Paradise dyed black. The hair is in curls, very much frizzed, and a braid of the back hair is brought across the brow (see plate). Echarpe caprice of very wide white satin ribbon, broche a la Jardiniere, in a rich pattern of flowers: the ends of the ribbon are fringed, and it is trimmed at each side with a narrow while blonde. Black silk gloves a jours, finished at the tops with a quilling of tulle. Black satin shoes, white silk stockings, necklace or cameos. 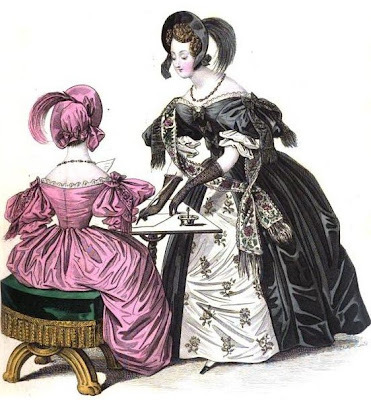 The dress of the sitting figure, which is of pink satin, is precisely of the same make.